Axis Communications has announced the launch of AXIS P3717-PLE Network Camera – a multidirectional, high image resolution camera, which provides flexible positioning of four varifocal camera heads. Offering a panoramic 360-degree overview or a combination of overviews in zoomed in detail, its IR illumination with individually controllable LEDs helps capture clear images even in low light or darkness. The cameras, fitted with an integrated weather shield, are suitable for indoor or outdoor use, from shopping centres and warehouses to hallway intersections and outer corners of buildings. The four-in-one camera also enables a lower overall cost for cabling and installation services and includes a redundancy system between the SD card and server should the connection with the server fail. The AXIS P3717-PLE Network Camera was named the winner in the Video Surveillance Camera of the Year Award category at the first inaugural Intersec Awards in Dubai. Ettiene Van Der Watt, Regional Manager, Middle East & Africa, Axis Communications, commented: “Innovation has always been key to our success and with the AXIS 3717-PLE, we have built an exceptional multidirectional camera with IR illumination. 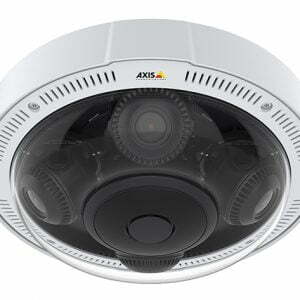 AXIS P3717-PLE was made available in October 2018 and is available through all AXIS distribution channels.